"The multiple layers in which one can enjoy Pablo’s compositions ensures that fans will be able to play Nobody’s Land multiple times. Top Tracks: The Days We’ve Lived , Rubberneck. "Open. Flowing. Free. 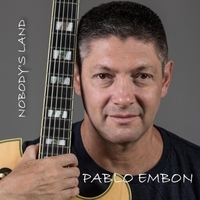 These words best describe the listening experience of musician, composer & sonic architect, Pablo Embon’s 17th studio album, Nobody’s Land. As a member of the music press, I am bombarded with music of all kinds on a daily basis. This saturating inevitability can—at times—remove the magic from the music. That said, there are rare talents whose work reverses said condition, and beckons the listener inside—no matter what their condition may be. This album is one such body of work. I know of no higher compliment I can pay this master of his art-form, who, unbelievably, still finds himself humbled by the never-ending process of his craft—even in the face of all of his own musical greatness. We look so very much forward to the next album".- The Ark of Music. "Pablo wrote and produced all of his music and he also performed it all with several different configurations of guitars and keyboards (listed below for you gear freaks). He is the ultimate D.I.Y. indie musician. I always thought of him as a guitar player, it looks that way on this cover. Do not let one picture persuade you in one direction. On Nobody’s Land, he is equally impressive on the various types of keyboards. At times you get that smoke-filled lounge feeling and others the get-up and dance nightclub feeling with his music, and others the kick back and just soak it all in, it soothes the soul. This artist gets it all covered for my discerning tastes" - Keith “MuzikMan” Hannaleck. "The entire album is a panoply of color, with every song featuring unique variations of tone and depth. Though Embon’s sonic palette includes elements from a wide range of musical styles, the end result of his efforts is a cohesive and vibrant journey which takes us across the world and back - what else could be expected of a musician whose 35 year career has spanned a geographical range extending from Argentina to Israel?"... "As I look back on my journey through Nobody’s Land, I realize that the joy I found there did not come from Embon’s instrumental prowess, although there were certainly many examples of that along the way. Instead, the joy I found came from the spirit of creativity that lay at the center of it all." - Keith Pro, Indie Band Guru .